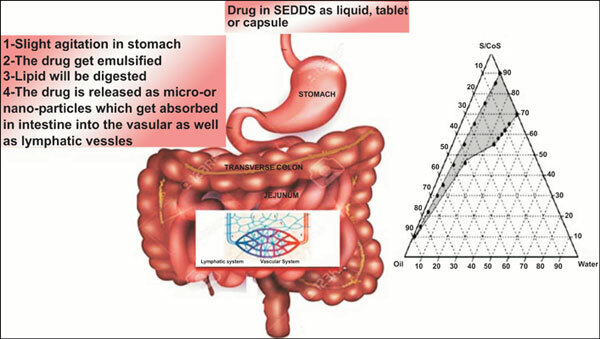 Objective: The objectives of this study were to examine the stability and conduct bioavailability of the prepared Probucol Self-Emulsified Drug Delivery System (PBSEDDS) in human volunteers. Methods: The methods included preparation of different PBSEDDS using soybean oil (solvent), Labrafil M1944CS (surfactant) and Capmul MCM-C8 (co-surfactant). The formulations were characterized in vitro for spontaneity of emulsification, droplet size, turbidity and dissolution in water after packing in HPMC capsules. The optimized formulations were evaluated for stability at different storage temperatures and human bioavailability compared with the drug dissolved in soybean oil (reference). Results: The results showed that formulations (F1-F4) were stable if stored at 20 °C. The mean (n=3) pharmacokinetic parameters for stable formulations were: The Cmax, 1070.76, 883.16, 2876.43, 3513.46 and 1047.37 ng/ml; the Tmax, 7.93, 7.33, 3.96, 3.67 and 4.67 hr. ; the AUC (0-t), 41043.41, 37763.23, 75006.26, 46731.36 and 26966.43 ng.hr/ml for F1, F2, F3, F4 and reference, respectively. The percentage relative bioavailability was in this order: F3> F4> F1> F2>. Conclusion: In conclusion, the PBSEDDS formulations were stable at room temperature. F4 showed the highest Cmax and the shortest Tmax. All the formulations showed significant enhancement of bioavailability compared with the reference. The results illustrated the potential use of SEDDS for the delivery of probucol hydrophobic compound. Probucol, Self-Emulsified Drug-Delivery System (SEDDS), stability, human bioavailability, PBSEDDS, bioavailability, hydrophobic compound.